Using trees as part of a landscape design adds beauty and function to any outdoor space. While trees offer many benefits, they also require special attention to keep them healthy and safe. Taking care of mature trees is hard work and may be overwhelming for the average homeowner, in Wilsonville or not. Trees become problems when they grow too big and become a danger to the surrounding structures, limbs become compromised, or disease spreads through the tree and puts other plants at risk. In these situations, it may be necessary to consider tree removal options. While some homeowners might want to save a few bucks and tackle the project themselves, complete tree removal is not an easy project and can present many dangers to an unskilled Wilsonville homeowner and any surrounding structures. The safest option is hiring a professional like ArborPro Tree Experts who have the equipment and expertise to get the job done quickly and safely. When homeowners attempt to repair tree damage by themselves, they often find that the work is overwhelming and exhausting. Proper tools and equipment are needed. When you hire ArborPro Tree Experts for tree removal in Wilsonville, homeowners can rest assured that we’ll perform a thorough job. We have a highly-organized procedure to bring down damaged or unwanted trees with minimal hassle or risk. Not only will the tree be brought down quickly and safely, but all waste material from the tree removal process will have be properly disposed and excess wood will be chopped up into firewood size pieces which can be used by you or disposed of however you see fit. 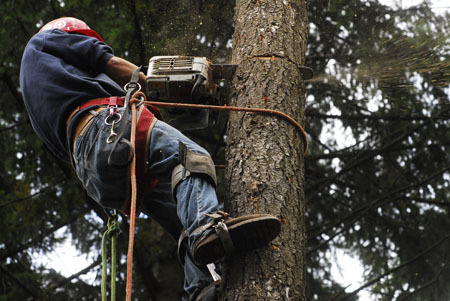 Before hiring any company to provide the tree care services, you should expect to see the following. We work in Wilsonville and all or the surrounding areas – give us a ring today.